Almost like Sham in 1973, Frosted ran in American Pharoah’s shadow in 2015, finishing behind him every time they ran together. He was usually good, but American Pharoah was always better. In their last race together, the Breeder’s Cup Classic, Frosted came in a surprising 7th. Several months later, after resting, training, time, and maturing, Frosted’s four-year-old career started with a huge win in Dubai. Though the track could be considered slower than American tracks, Frosted still ran easily to take more than a second off the track record. He obviously loves the track there. Could he be our next American winner of the Dubai World Cup in March? 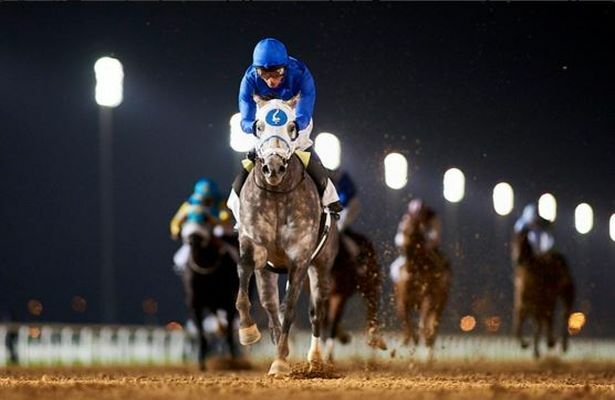 Frosted took an impressive step toward his early spring goal of the Dubai World Cup (UAE-I) when he overwhelmed eight rivals to win the $250,000 Al Maktoum Challenge Round 2 Sponsored by EGA (UAE-II) Feb. 4 at Meydan.